Last week I partook in one of the most amazing experiences of my life. I attended the one week workshop in Amherst, MA called the Illustration Master Class (or IMC for short). It's a workshop started by Rebecca Guay and features some of the best artists in the genre of Imaginative Realism. 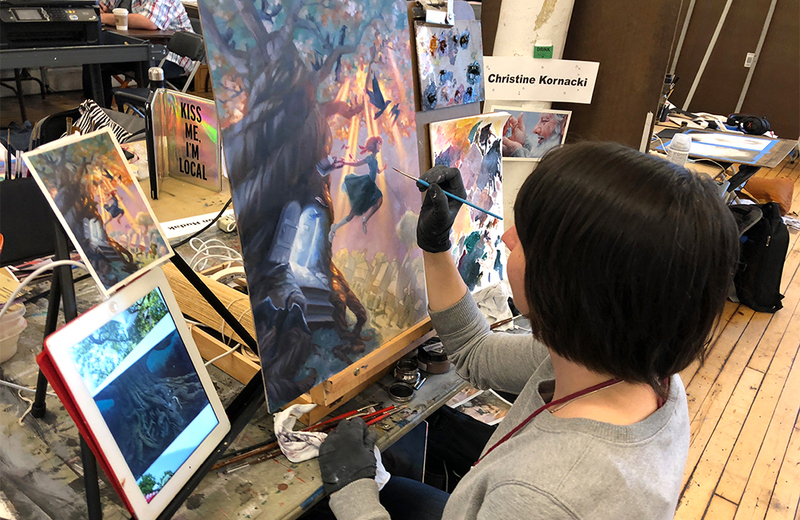 It includes artistic giants such as James Gurney, Greg Manchess, Donato Giancola, Greg Ruth, Scott Fischer, Dan Dos Santos, Boris Vallejo, and Julie Bell. Plus the addition of select creative directors including Irene Gallo from Tor, Lauren Panepinto from Orbit Books, and Jeremy Jarvis from Magic the Gathering. It has a relatively free format, where for one week students can work on whatever they'd like, and the faculty will walk around giving feedback to those who need it. Throughout the day the faculty will do lectures and demos that you're welcome to view, or you can just keep working. I've known about the IMC for about 10 years, but it was always a matter or finding the time or the money to fit it in. Finally this year, I pushed aside all excuses and made it happen. And it was one of the best decisions I've ever made. Something you may not know about me is that I'm a huge Sci-Fi and Fantasy fan. I'm sucker for time travel, worm holes, robots, space ships, knights, dragons, magic, and just about anything out of the ordinary. These are few of my favorite things. A friend of mine lent me Alanna, by Tamora Pierce in 8th grade and I devoured it in two days. That summer I spent every waking moment reading. Once I had read through all of Tamora Pierce's books, I went back to the bookstore hungry. I was hooked. From there I found Madeleine L'Engle, Roald Dahl, C.S. Lewis, J.K. Rowling, Philip Pullman, Diana Wynne Jones, Lois Lowry, Frank Herbert, Arthur C. Clarke, Neil Gaimen, Ray Bradbury, Ursula K. Le Guin, Margaret Atwood, Steven King, and so on. Most days if you were to step in on me in my studio I'd probably be enthralled in one of their worlds. I love the articles on Tor and io9, I idolize all of the artists on the blog Muddy Colors, and my favorite podcasts are One Fantastic Week and Imaginary Worlds. For so long, this has been my favorite media to absorb, but because I idolized it, I never thought I could be apart of this world. Then two years ago I saw Donato Giancola give a presentation at the Society of Illustrators. He has been one of my all time favorite artists for a long time, and on that day he talked about why he loves illustrating book covers. What resonated with me was the idea that a book cover needs to encapsulate a book in one powerful image that entices a viewer, gives a hint of the story, but doesn't give anything away. It's the ultimate puzzle. Then it hit me, why aren't I already doing this?! Since then I've been slowing rebuilding my portfolio and pushing it more towards the fantasy and book cover realm. Then, I finally reached the point where I felt I needed some input from the best in the industry to help push myself even harder. In case you haven't gotten the impression, I am a superfan of all of these artists. So needless to say, on the first day I was completely star struck. We were told to show up with 1-4 thumbnail sketches to be critiqued by several of the staff. Irene Gallo, the Creative Director from Tor, provided 5 prompts you could choose to work from, or you could work on your own project. I instantly fell in love with the book Irene provided, In An Absent Dream, by Seanan McGuire. It's the 4th book in the Wayward Children Series (that doesn't come out to Jan 2019), and it happens to be a series that I'm a huge fan of. I'm a sucker for any "Alice in Wonderland" or "Narnia" type stories, that involves characters being dropped into a different world. And this book fell right into that genre. I read the book in less than 24 hours and was completely enthralled by McGuire's world, once again. Knowing that my thumbnails were going to be reviewed by some of my idols, I worked extra hard to push myself. I created 80 initial thumbnails in my sketchbook. From those I narrowed it down to my top four, that I then redrew and refined digitally. These four I brought on the first day for my critique with Donato Giancola, Scott Fischer, Greg Ruth, and Boris Vallejo (I may have had a minor panic attack when I was given the list of my critique group). 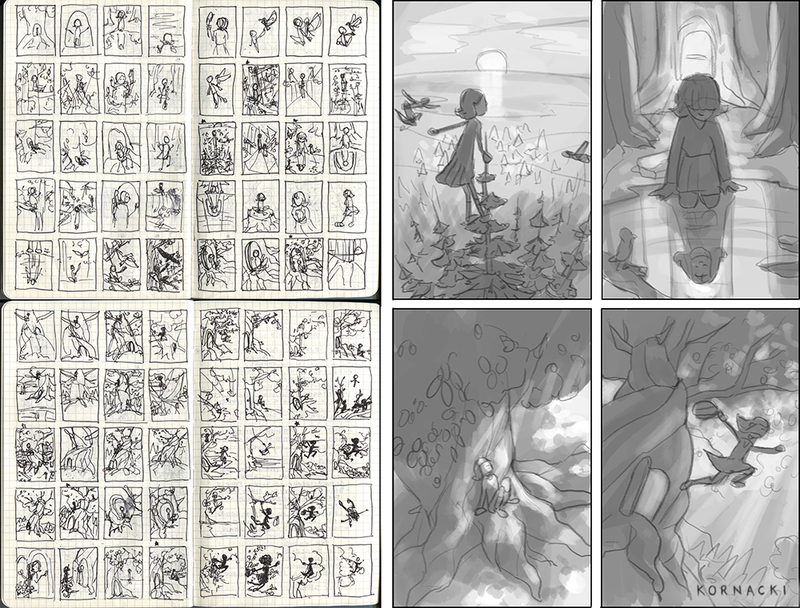 My crit group was surprisingly happy with all of my thumbnails, bouncing back and forth between several ideas. After a little deliberation, they collectively decided on my 4th thumbnail and gave me the go ahead to start developing it. The next three days involved gathering all of the information I needed to create this painting. This book is about a girl who goes through a doorway in a tree and travels into a Goblin Market, rich with rules and unforgettable characters. To get the proper references, I built a 3D model in SketchUp, photographed one of my classmates as my model, and went walking around campus to find the perfect tree. Once I had my references, I started my full-value sketch and color studies. With these, I got the feedback and approval from several of the faculty, I was finally able to dive into the main course, the painting! So I transferred my sketch onto my board, giving me only two days left to complete the painting. Left: Full-sized value sketch. Right: Color study in oils. After watching painting demos by several of my favorite oil painters (James Gurney, Donato Giancola, and Greg Manchess), I was feeling very eager to paint. Along the way, the faculty were each pushing me to really stretch the fantasy of my piece. This was exactly what I had come for, and I'm incredibly grateful for each piece of feedback I was given. Two days later, I was able to (mostly) complete my painting. It was a long exhausting week filled with inspiring lectures, and magical moments bonding with all of the other students and amazing faculty. A lot of the students can come out of this week feeling confused by all the conflicting feedback they get from the different faculty. Luckily, everything seemed to go smoothly for me throughout the whole process. Each piece of advice I got came at the right moment, and helped elevate my piece even more. I never felt lost or unsure of myself, I just felt like I was being guided along a path that I had already started. I had the pleasure of sitting down with Irene Gallo and Lauren Panepinto for portfolio reviews. They both gave me great advice on how I can target my portfolio even more to the Mid-Grade or Young Adult book markets. It took me several days to sleep and really absorb all the feedback I got. This was a completely unreal experience, and I came home overflowing with ideas. I had several tweaks to do to my painting once I was on solid ground again. On top of that, I wanted to do a postcard blast with this new painting. So I completed the back of the postcard with an original sketch to go with the story. In the end, it was worth every penny and sleepless night I spent there. Hopefully my portfolio will start to reflect these changes I feel inside, and if all goes well I hope to go back again next year! Pencil Drawing for the back of my Postcard.